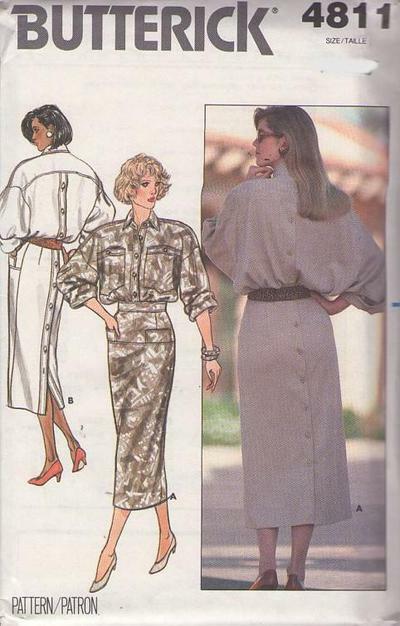 1987, 80s Career, Retro Couture Clothing Patterns - MISSES' DRESS Dress, below mid-calf or lower calf, has collar and band, dropped shoulders, shoulder pads, very loose-fitting, blouson bodice, low armholes, yoke with forward shoulder seams, mock bands, pockets, front yoke, welt pockets, straight skirt and long sleeves rolled-up (wrong side shows). Purchased belt. No Provision Made for Above Waist Adjustment.